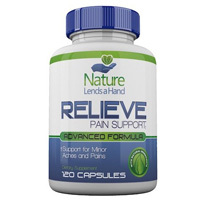 Relieve Pain Support is a natural pain reliever and anti-inflammatory from Nature Lends a Hand. According to this dietary supplement’s product page on Amazon (an official product page for Relieve Pain Support didn’t exist at the time this review was created) it provides natural, safe, relief from pain and inflammation without harmful side effects. Its ingredients supposedly target pain and inflammation, providing effective relief from sciatica pain, muscle aches and pains due to over-exertion, common arthritis pain, nerve pain, back pain, joint pain, neck pain, leg pain and shoulder pain, tooth pain and even menstrual cramps. This dietary supplement marketed for pain management claims to be an effective alternative for individuals who want to stop taking NSAIDs (Nonsteroidal Antiinflammatory Drugs), such as ibuprofen, aspirin, naproxen, etc. At the time that this review was written, the Relieve Pain Support formula consisted of Ceytl Myristoleate, Hyaluronic Acid, MSM (methylsulfonylmethane), Holy Basil Leaf, Tumeric, Ginger Root Extract, Green Tea Leaf, Boswellia Serrata, Bromelain, Skullcap, trans-Resveratrol, Berberine HCl. Ceytl myristoleate may possibly be effective for the treatment of osteoarthritis as it may help to lubricate joints and muscles, increase flexibility and soften tissues. It may also help to reduce inflammation and boost the immune system. Hyaluronic acid may also help to lubricate joints and MSM methylsulfonylmethane might be helpful in relieving pain from osteoarthritis. Tumeric, another ingredient in the formula, is known for helping to reduce swelling and could be possibly effective at relieving osteoarthritis pain. The good news is that Relieve Pain Support does appear to contain many clinically studied ingredients that some research has shown can help to relieve pain. The bad news is that the dietary supplement’s formula itself has never been clinically studied or proven safe or effective. Therefore, regardless of what claims may be made about this product, there is no proof that it actually works. The recommended dose is to take 1 capsule one to two times daily, preferably with meals, or as directed by a healthcare practitioner. Prior to taking Relieve Pain Support, you should first consult with your doctor, especially if your intention is to take it for the long-term to treat pain-related conditions such as arthritis. Furthermore, this product is intended for healthy individuals 18 years or older. You should also consult with your doctor prior to taking this dietary supplement if you are pregnant, nursing, or have an existing medical condition. Users should also be cautioned that this product is made in a facility that also produces milk, soy, wheat, egg, peanuts, tree nuts, fish, and shellfish.